*Update - 6/24/13: Did you enjoy reading the Comic Conspiracy Comic Book Club selection All Star Superman? Fifteen people voted, and the results are as follows: 13 Yes Votes, 1 No Vote, and 1 Vote for Indifferent. Thanks for voting. After some listener input we decided to start having a monthly Comic Book Club. So, every first episode of the month we will announce what comic book we are going to read, and on the last episode of the month we will discuss the book at some length. There will be a poll for each book we read every month so come here to cast your vote. 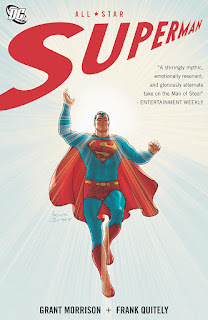 "The complete 12-issue run of ALL-STAR SUPERMAN by Morrison and Quitely is collected in a single trade paperback!Witness the Man of Steel in exciting adventures featuring Lex Luthor, Jimmy Olsen, Lois Lane, Bizarro, and more! Plus: Superman goes toe-to-toe with Bizarro, his oddball twin, and the new character Zibarro, also from the Bizarro planet." Due to the release of the Man of Steel movie on June 14th, and because this book is written by Grant Morrison with art by Frank Quitely, and the fact that Ryan is lazy; he decided that this would be his pick to launch the Comic Conspiracy Comic Book Club. So, get yourself a copy and give it a read. Let us know what you think. We will discuss this title at length on Episode 113 of the Comic Conspiracy. Download the issue from our Digital Storefront.